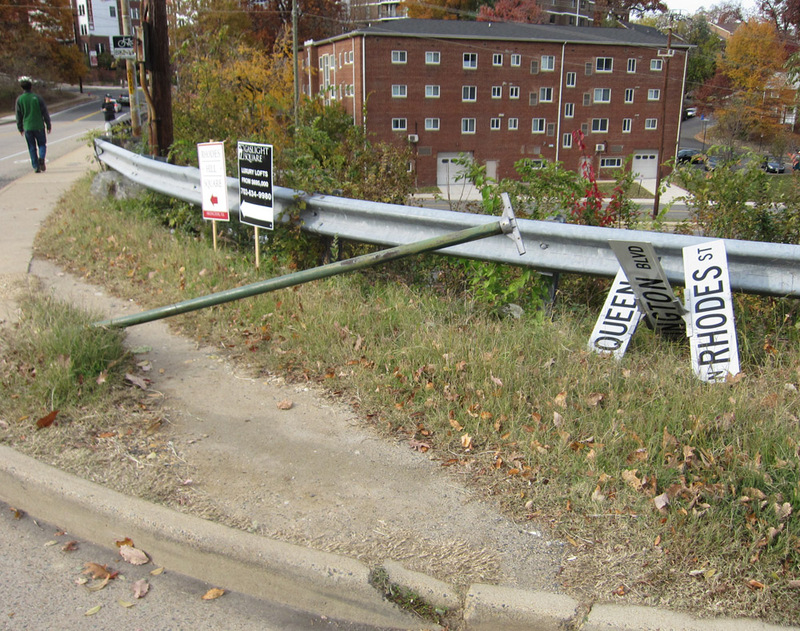 The street sign at the corner of Queen St. and Arlington Blvd (south side of the bridge) has been knocked down. This may have been a drunk driver missing the right turn by a large margin. On the other side of Rt. 50, at the corner of 14th St. and N. Fairfax Dr., a driver failed to yield to a yield sign. Running over street signs is much better than running over pedestrians or cyclists. But be careful, because some drivers may not make good choices. I noticed the sign on Rhodes yesterday while riding past it on my bike. A good reminder to keep my eyes wide open for crazy drivers. I live at Fort Meyer Drive and Ode Street. Signs in the area are often knocked down. Customers leaving the Quarterdeck Restaurant at closing are often loud and rowdy and leave that way in their vehicles. A tighter police presence would be appreciated around closing hours, which would also help with noise. Why is there not a 4-way stop at that Rhodes/Arlington Blvd intersection? I bike through there often in the am commute, and I'm usually forced to play chicken with cars turning left from EB 50 onto Rhodes. In fact, I bet that's what sent the car off the road into that sign - the intersection looks like it should have a 4-way stop, so one car expected it to, and another plowed through and got surprised. How do we get the signs fixed? Or do they simply remain down indefintely? 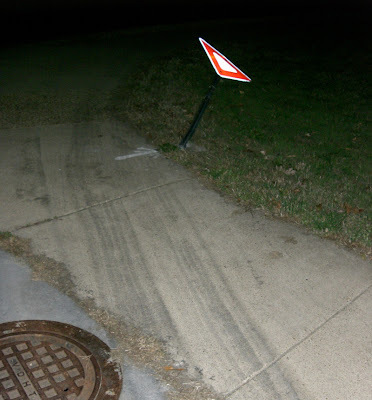 I called in the down signs to Arlington County last night. I don't know how long before they will be repaired.